Join the prayer of the Congregation delegates. This is the text of the morning prayer for October 28, 2016. Stay at home if the idea of becoming a jesuit makes you unsettled or nervous. Do not come to us if you love the Church like a stepmother rather than a mother. Do not come if you think that in so doing you will be doing the Society of Jesus a favour. Come if serving Christ is at the very centre of your life. Come if you have broad and sufficiently strong shoulders. Come if you have an open spirit, a reasonably open mind and a heart larger than the world. Come if you know how to tell a joke and can laugh with others and… on occasions you can laugh at yourself. 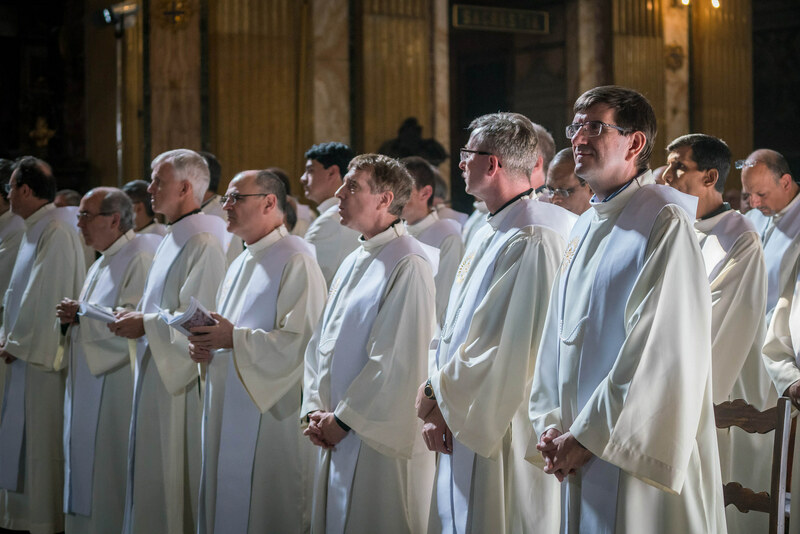 Father, in the name of Jesus, through the power of your Holy Spirit, we pray that You inflame the hearts of men with courage and trust and the desire to labor for Your kingdom as Jesuits. We ask You through the intercession of Mary, our Mother, Saint Apostles Simon and Jude St. Ignatius, and all Your saints, to bless the Society of Jesus with bountiful vocations that it may continue to serve Your Church with passion and zeal.